Esposito was named to the Big East all-freshman team and will make her first collegiate start in the women's NIT. 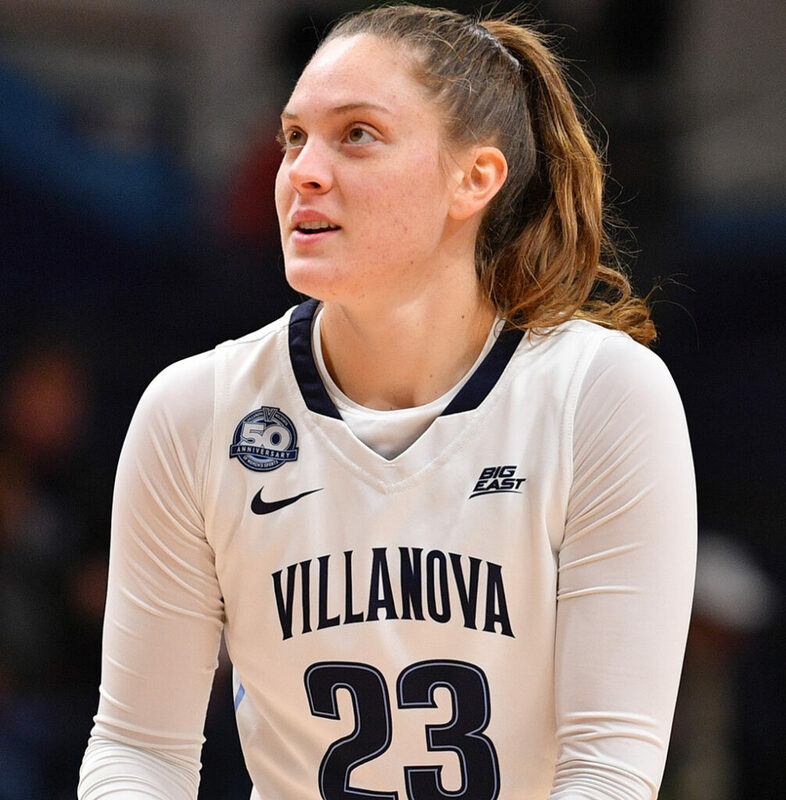 There were times, especially early in the season, when Emily Esposito wasn’t sure she should have been on the court for the Villanova women’s basketball team. She wondered to herself why Villanova Coach Harry Perretta had her in the game. Then he started calling for isolation plays to get her the ball. And he kept calling those plays. And Esposito – the former Gorham High star and Miss Maine Basketball winner in 2017 – rewarded that confidence. A 5-foot-9 redshirt freshman for the Wildcats, Esposito was named to the Big East all-freshman team. Friday night, she will get her first collegiate start when the Wildcats (18-12) play Old Dominion in the first round of the women’s NIT. Esposito averaged 16.8 minutes, 4.1 points and 1.9 rebounds for Villanova. She had 28 assists and only 14 turnovers. Three times this year she scored 13 points. Esposito is also comforted by the fact that Brie Wajer, the former Lincoln Academy star from Newcastle, transferred to Villanova from Division II Wingate University in North Carolina. She made the team as a walk-on and had to sit out a year according to NCAA transfer rules. The two were teammates on the Maine Firecrackers AAU team and the 5-7 Wajer said Esposito persuaded her to come to Villanova. “I feel fortunate and blessed to have ended up at such a great school and in such a great program,” said Wajer. And while it was difficult to sit out a year, Wajer made an impression as a practice player. “I was just trying to bring my best energy to practice every day,” said Wajer, who hopes to become a college basketball coach. • Shannon Todd, of York, will also play in the women’s NIT for Northeastern (20-11), which plays at Butler on Thursday. A 6-foot junior guard, she is the Huskies’ second-leading scorer, averaging 11.2 points in 30.4 minutes, and is second in steals (26) and third in assists (58). • Victoria Lux, of Arundel and Thornton Academy, finished her career at Bentley with 1,236 points (12th all time) and 940 rebounds (fourth all time). The Falcons’ season ended last Friday with a 59-40 loss to Saint Anselm in the first round of the NCAA Division II East Regional. Lux, a 6-1 forward, was the team’s leading scorer (11.5 points) and rebounder (7.1). Houlton’s Kolleen Bouchard also played for the Falcons, but her freshman season was cut short by a knee injury on Dec. 30. She was averaging 7.4 points, 2.6 rebounds and 2.3 assists. • Jess Willerson, of Falmouth and McAuley High, got in 16 games for Cornell (12-13). Willerson, a 6-1 junior forward, played a total of 65 minutes and scored 15 points, grabbing eight rebounds. • Montana Braxton, of Cape Elizabeth, played in seven games for Navy (10-19). Braxton, a 5-10 junior forward, averaged 1.4 points and 1.4 rebounds. • Allie Clement, of Falmouth and McAuley, finished her career at Marist as a fifth-year senior after suffering season-ending knee injuries the previous two years, Clement played in 19 games, averaging 5.9 minutes and 1.4 points. • Nia Irving, of Fairfield and Lawrence High, was a third-team all-Patriot League selection for Boston University. A 6-1 junior forward, Irving led the Terriers (15-14) in rebounding (8.5) and was second in scoring (11.8 points) and blocked shots (16). • Mary Butler, a 6-foot senior forward from Bangor, started 21 games for Brown (9-21). She averaged 4.4 points and 4.3 rebounds. n Ashley Storey, of Cumberland and Greely High, and Alisha Aube, of Westbrook and Thornton Academy, had their seasons ended by injuries. Storey played in 15 games for New Hampshire, averaging 17.1 points and 6.1 rebounds, before suffering a foot injury. Aube appeared in the first two games of the season for Adelphi, where she had transferred to from Butler.